Stand out from other party dishes with this spirited Antler Centerpiece Tray from Arthur Court. Two elk heads face away from each other on opposite ends of this piece, elongating the shape as they seemingly run in the other direction. 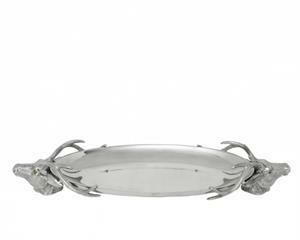 Handcrafted in sand-cast aluminum, this tray carries an unspoken, yet palpable mystique. Size: Length: 24.0" / Width: 9.0" / Height: 4.0"